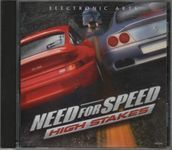 "Need for Speed: High Stakes (also known as Need For Speed: Road Challenge in Europe and Brazil and Over Drivin' IV in Japan) is a 1999 racing video game, developed by Electronic Arts Canada and published by Electronic Arts. It is part of the Need for Speed series, once again featuring a host of exotic sport cars and tracks located in Western Europe and North America. It is notable in the Need for Speed franchise for being the first installment to have a damage model." Source: Wikipedia, "Need_for_Speed:_High_Stakes," available under the CC-BY-SA License.